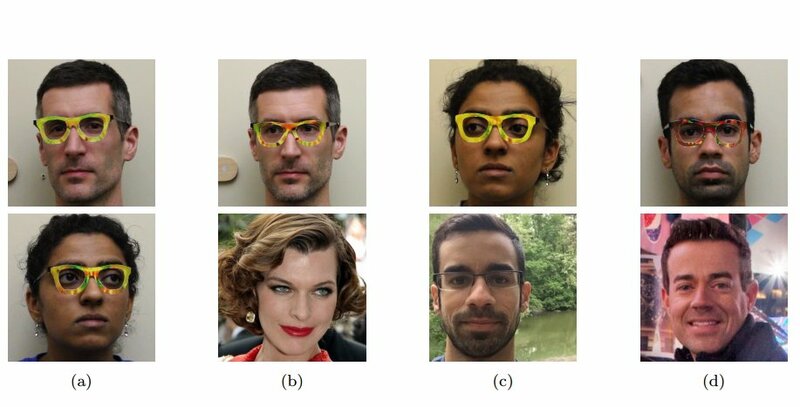 State-of-the-Art Face Recognition, researchers from Carnegie-Mellon and UNC showed how they could fool industrial-strength facial recognition systems (including Alibaba's "smile to pay" transaction system) by printing wide, flat glasses frames with elements of other peoples' faces with "up to 100% success." In a test where researchers built a state-of-the-art facial recognition system, a white male test subject wearing the glasses appeared as actress Milla Jovovich with 87.87% accuracy. An Asian female wearing the glasses tricked the algorithm into seeing a Middle Eastern man with the same accuracy. Other notable figures whose faces were stolen include Carson Daly, Colin Powell, and John Malkovich. Researchers used about 40 images of each person to generate the glasses used to identify as them.